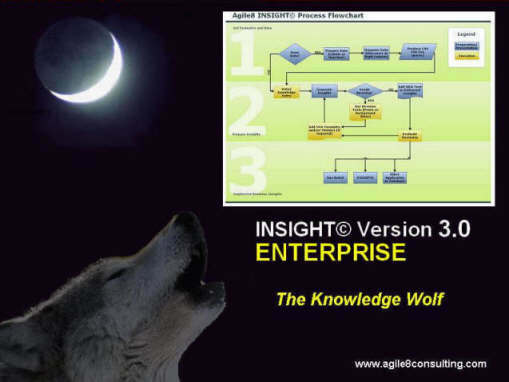 Agile8 Insight© Enterprise Process Analysis Solution. Most of the value added in today's organisations is not in systems, but in the minds and interactions of people. However, organisations lack a facility to capture, codify and disseminate the best ideas and innovation held as experience and insights in the minds of the top 5-10% of staff. The main problem is that our best employees, for example top salespeople, are not able to convert examples from past experience into 'rules' that can be shared across the organisation. Insight© is unique because it is designed for use in the front office - where decisions are made. By contrast, today's data mining tools -while powerful - are mostly for use by back-office statisticians and other specialists who cannot easily communicate with your front-line businesspeople and decision makers responsible for optimising customer, finance, operations and human resource processes. With back-office data mining, many of the business rules in areas ranging from credit assessment through a customer acquisition and operational process modelling are therefore suboptimal. By contrast, the Insight© solution uses a front-line approach to business rules generation. This ensures decision-makers and business specialists are fully involved, engaged and challenged at their level of understanding, and that delivered business rules are more robust and enduring. Insight©’s unique approach retains the power of the best data mining solutions, but it has a simple, non-technical interface designed the business use. Insight© is a generic solution that is capable of converting specific experience and insights in the form of examples from past experience into 'rules' that provide instant feedback and challenge to business users at their level of understanding. Our experience demonstrates that if such a solution fails to provide useful challenge and feedback within about 10 minutes then it will be unlikely to be acceptable within an operational environment. Our parent organisation, 8SOLUTIONS GROUP has used this '10 minute rule' as the main criterion in the design of the Insight© Process Analysis solution. Our Insight© Enterprise Process Analysis Solution, which will be shortly available in Chinese as well as English, is designed the building large, integrated knowledge and data mining solutions.